In 1957, The Curse of Frankenstein ignited a new age of cinema gothic. The film, wildly successful worldwide, instantly transformed the careers of its stars, Peter Cushing, Christopher Lee and Hazel Court. It propelled Hammer Films of England to a position as the dominant and highly influential horror film factory — perhaps one should say “boutique” — of the era. It also established the signature Hammer style, with rich colors, elegant costumes, intricate sets and accomplished casts that belied its low-budget underpinnings. 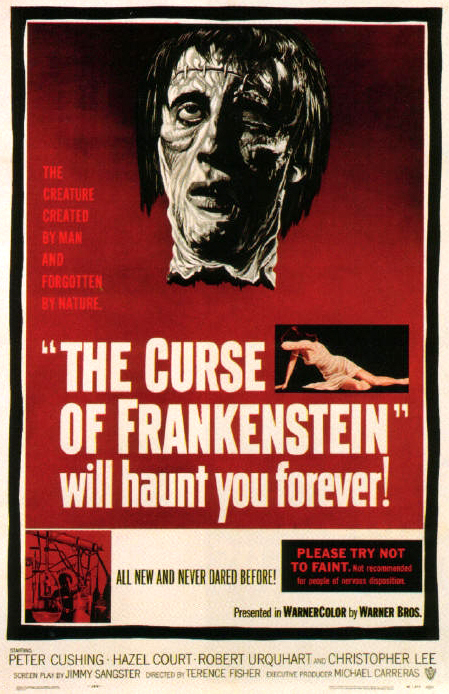 The Curse of Frankenstein was directed with considerable aplomb by Terence Fisher. It would be the turning point of a career that already counted over 30 films. He would almost exclusively devote himself to horror from then on, retooling such characters as Dracula, Dr. Jekyll, the Werewolf and The Phantom of the Opera. Even his Sherlock Holmes movie, The Hound of the Baskervilles, played as gothic horror. Fisher would direct all but one of Peter Cushing’s six Frankenstein films, plotting the character’s cruel career from youthful arrogance to desperate old age. It is a unique and ever engrossing set of films. Fisher was known to trust his cast and crew, intervening only to help them focus on the context of the scene at hand. Fisher’s true contribution was cerebral. His films are deeply iconoclastic studies of men and women seduced by evil, pushing at the limits of morality. It is significant that these films, usually shot in six expeditious weeks with bargain budgets, are still being researched and analyzed today, 27 years after Terence Fisher’s death. This summer, the Cinémathèque Française in Paris held a vast, month-long retrospective of Fisher’s films, screening no less than 40 different titles, celebrating “the exemplary coherence of Terence Fisher’s oeuvre”. Richard Klemensen’s Little Shop of Horrors, an indispensable magazine devoted to the study of Hammer Films, has just come out with an entire issue about Terence Fisher. Considering LSoH’s perfect record, I can recommend this one with complete confidence, sight unseen. You can order directly from the publisher, here. 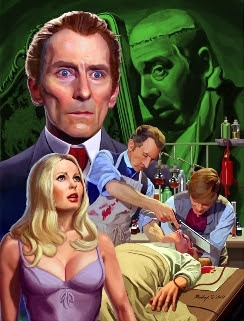 The Frankenstein montage painting, by Mark Maddox, appears in the Terence Fisher issue of The Little Shoppe of Horror. Click through to see it, and other art, including the cover of the issue, at glorious full size.